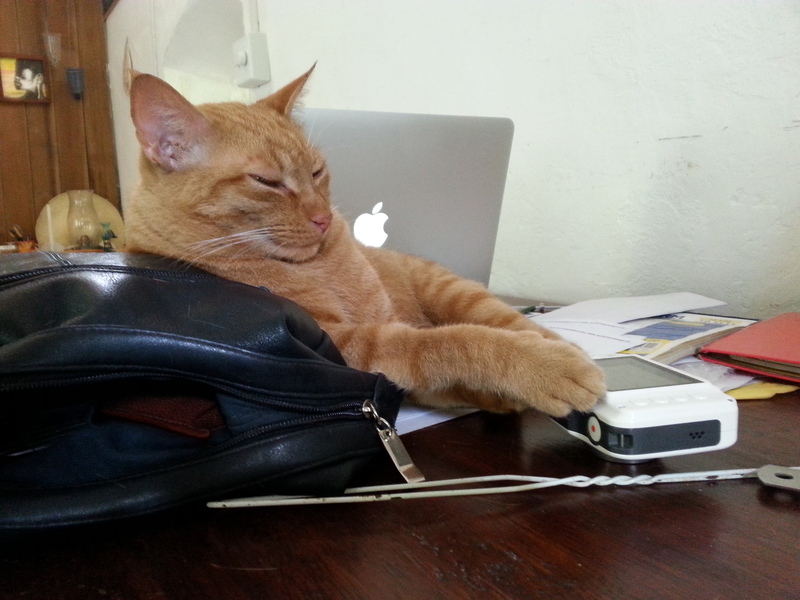 My sleepy secretary cat: Chinah. 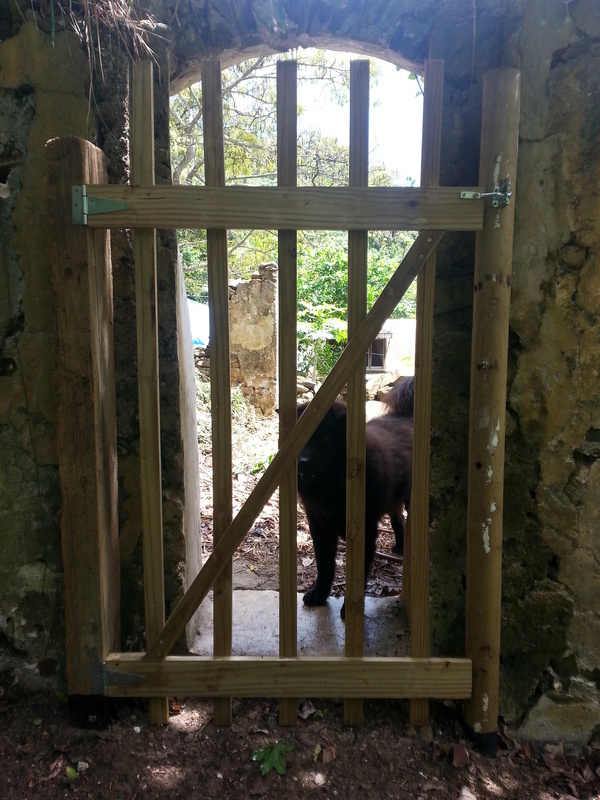 Jan built another gate to keep the big bad wolves from escaping and terrorizing all the cyclists and joggers. 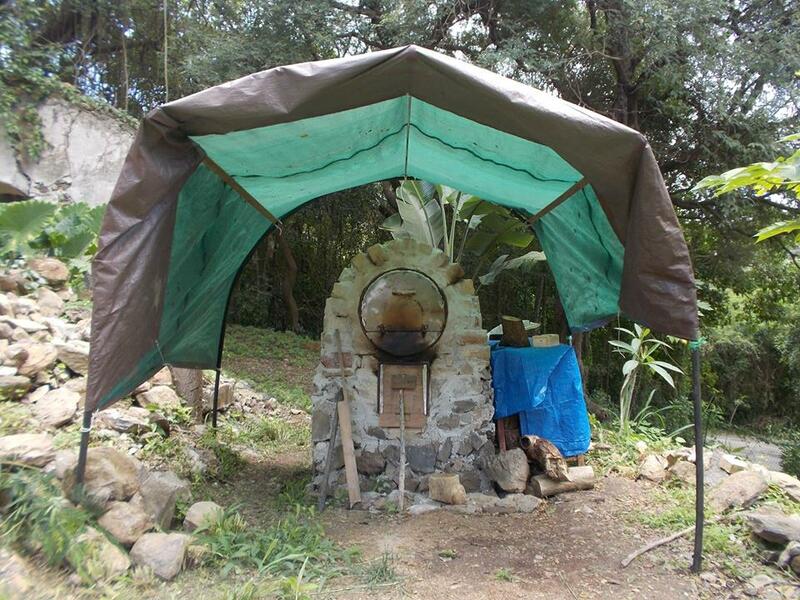 On Friday we had to build a new shelter for the oven, due to the amount of rain we’ve been getting. PVC pipe on rebar, with cross-braces and a tarp. 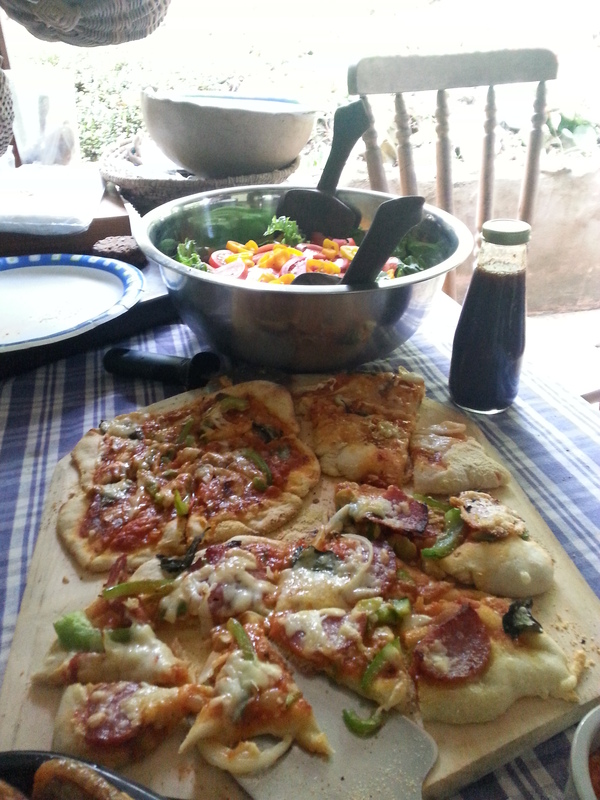 Hopefully it’ll last until we have time to build the oven a real roof! 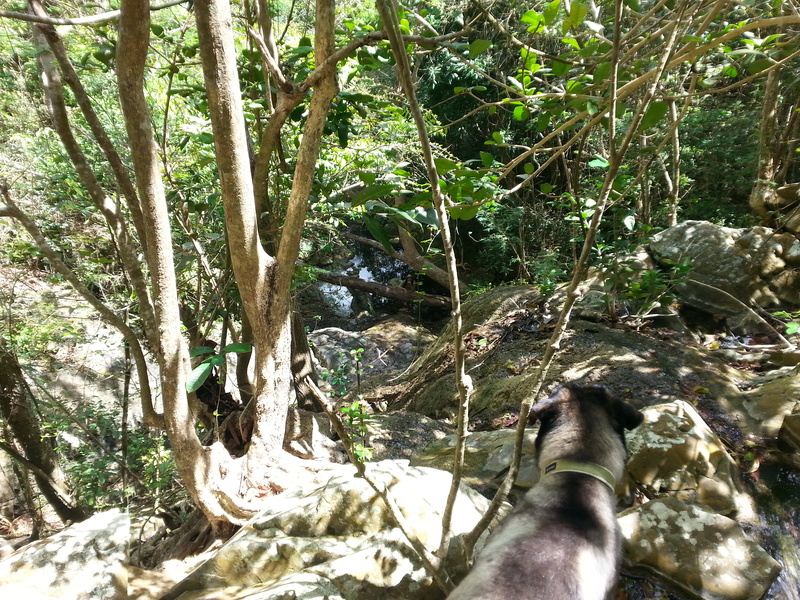 Despite a certain desire to sleep in, this morning Mandy, Jan, I, some friends, and the two dogs (Zozo and Zada) took a lovely Easter hike up the Caledonia Gut (stream bed), including a steep ascent (for a couple of us brave souls) up the face of a (trickling) waterfall. It was fun, beautiful, and far more healthy than sleeping the day away! Sometime I shall have to hike all of the way up, to the top of the “mountain”, from which there are great views and a road going down the other side. I may be missing out on the Baltimore spring, but I shall not miss out on the hiking! Zada had great fun splashing around in all the pools! Building progress was a tad slow this week, thanks to a day of the ‘flu and subsequent exhaustion. Perhaps it’s just reached that point where I need a few days’ break, yet we all know that will not happen for I am far too motivated to possibly take more than one day at a time off! 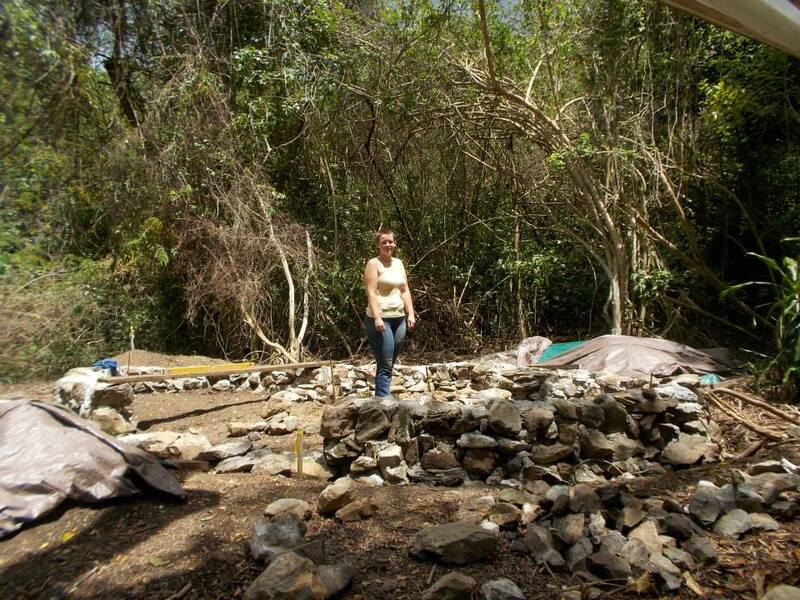 Despite everything, Mandy and I were able to get the stone foundation wall up to an appropriate height to set in the wooden posts, and those have all been measured for positioning and length, now it’s just up to me to accumulate the last few posts before I may raise them and brace them in place. 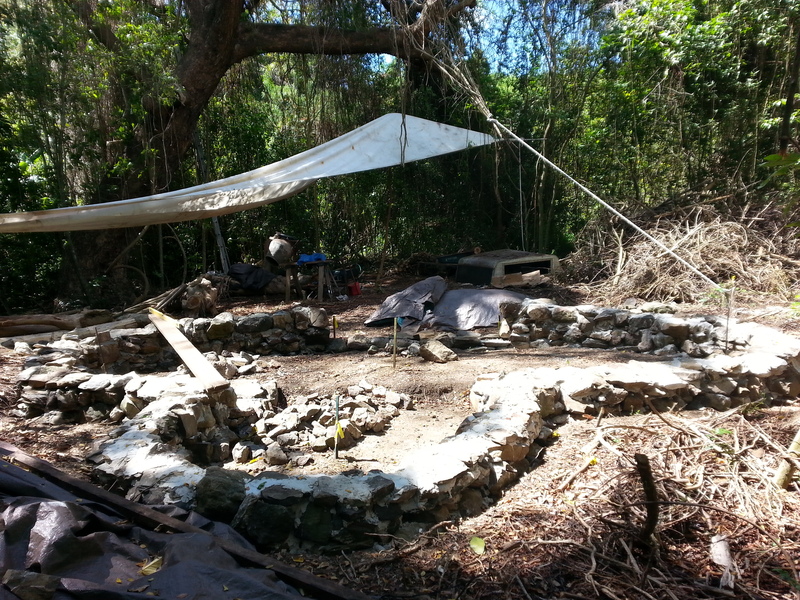 Once that has been accomplished I’ll be able to put the very last course of stone around the posts – bedding them in – and then will move on up to the bamboo lathes and building in the loft and “furniture” before breaking out the plaster. 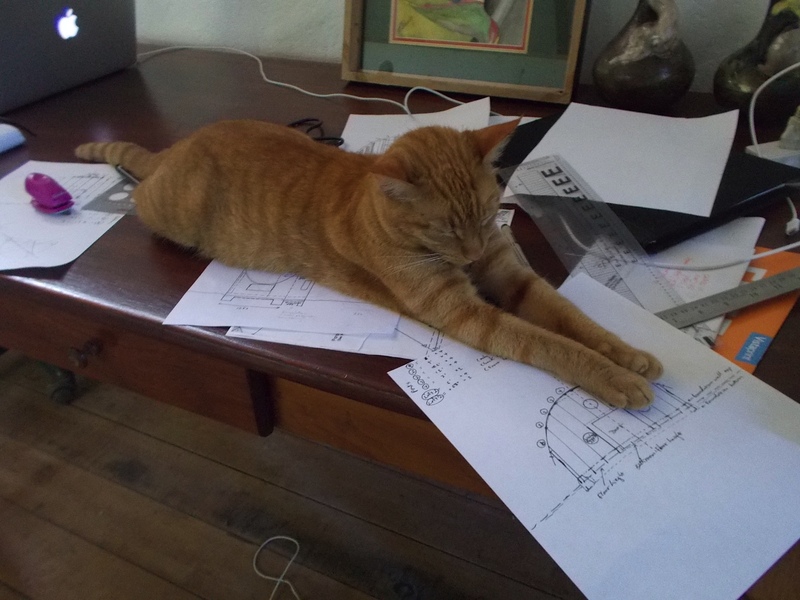 Nearly done with stonework – exciting for me, though Mandy claims to actually like this part of it! Walls up to post height! 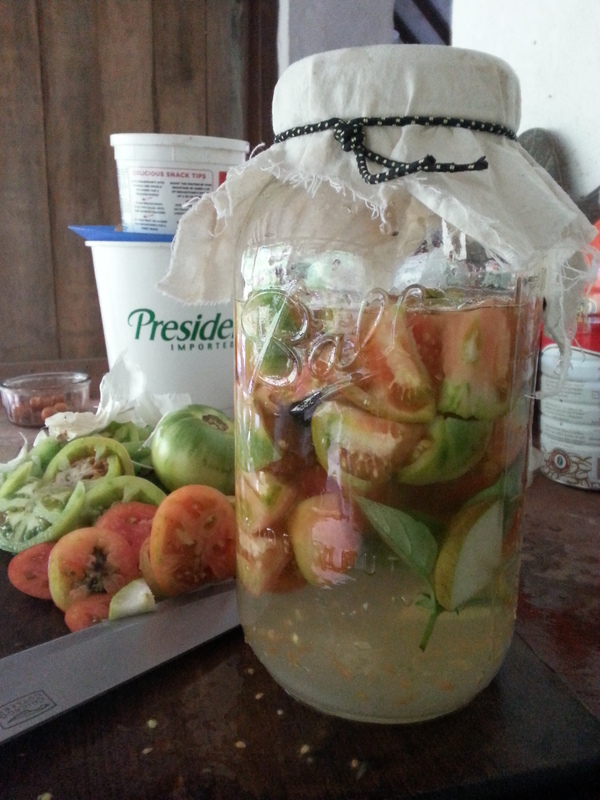 In other matters around the property, we’ve had an influx of tomatoes, both ripe and green from Paul (our tenant and neighbour), so early in the week I set some tomato vinegar and some green tomato lactobacillus pickles to set – the vinegar is just chopped tomato in a sugar solution, the pickles are chopped green tomato, seasoning peppers, garlic, and spices in the saline solution, weighted in the antique pickle crock that my Mom gave me this winter. The pickles will sit for a couple of weeks until pickly, while the vinegar will be strained today and then set to cure for a couple more weeks – much like making wine, but purposely contaminating it so that it instead turns to vinegar. It’s been raining every day, sometimes for hours, which whilst annoying for the building is great for the garden! I have a brand new row of greens coming up nicely (dug and seeded less than 5 days ago) and the rows I’d planted out (started in seed trays) 1-2 weeks ago are already producing greens and basil. An old BBQ of the horizontal barrel shape was just found at one of the dumps, so that will shortly be a raised bed for some cucumbers, which if planted in the ground here immediately get devoured by aphids – an ongoing problem that I’m determined to circumvent without the use of chemicals! 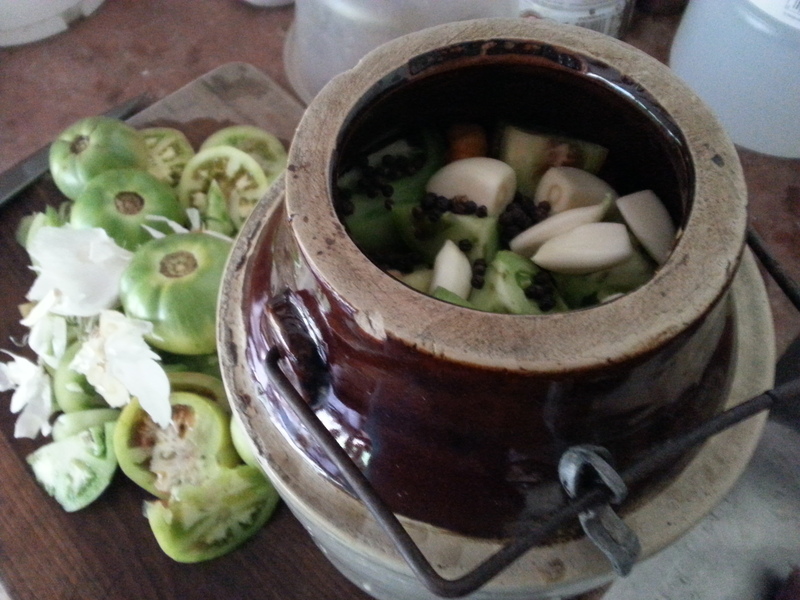 Green tomato pickles in an antique pickle crock! Did I mention that the Nid now has its own driveway? It’s been too rainy to actually get the truck up it, but in theory it is now a drive-able road! I’m hoping that my dear Uncle John will be back soon to grade it a little, making it easier to get truckloads of gravel and sand up to the Nid – saving hours of back-breaking labour carting such substances by wheel-barrow. All in good time. Cheers, and happy Easter to all my followers and fans!